There are a ton of metaphors for life and I keep finding myself at the metaphor of a puzzle. The pieces of all of our lives are somewhere within our grasp and it’s on us to figure out how they all fit together and make a beautiful picture. There’s no one I’ve finished more puzzles with than my great grandma. Dogs, cats, barns, Powder Puff Girls… It didn’t matter; we put together all the puzzles we could get our hands on. We were pretty good, too. We made quite the team putting those pieces together, but now one of my key pieces to life is gone. 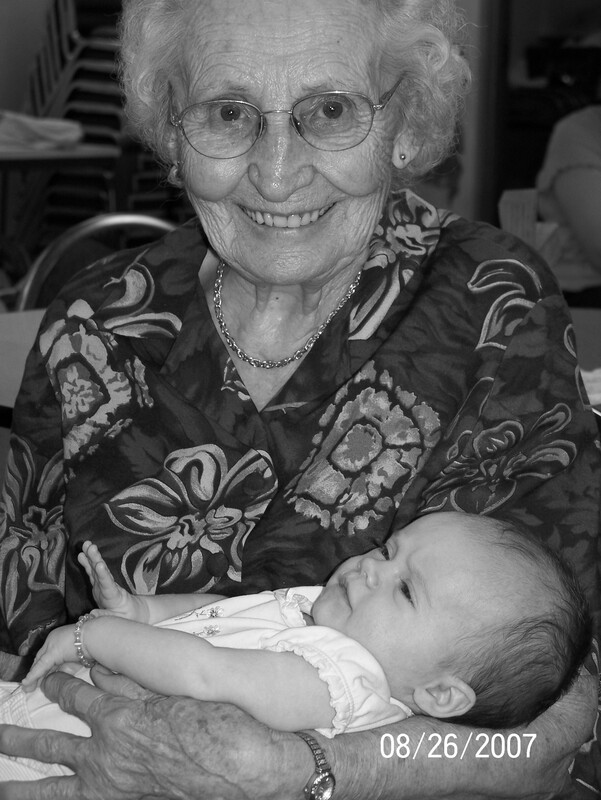 My great grandmother Doris Hahn passed away on Saturday, November 14, 2015. When I was a much younger Collin, I’d go to my great grandma’s house during the day in the summer while Mom and Dad were at work. It was a handful of years that this happened and those memories will always be a huge piece of me. She’s the reason I love The Price is Right. She didn’t have anything than over-the-air basic channels until after my summer days there and there is never anything on in the middle of the day anyway, except for Bob Barker. At 10 o’clock, the radio in the kitchen would stop playing KNUJ and we’d be in the living room watching The Price is Right. Well, I’d be watching it. Somewhere in there, she always snuck back to the kitchen to make lunch. Lunch, nine times out of ten it seemed, was ring bologna and mashed potatoes that were put through a ricer. Every time you sat down for a meal, you know you’d say a prayer, too. Every single time. The meal was not complete without a glass or two of Dr. Thunder. Yes, the Wal-Mart brand knockoff of Dr. Pepper and Mr. Pibb. I loved my great grandma, but there is no comparing Dr. Thunder and Dr. Pepper. Nontheless, she’s probably the reason I love Dr. Pepper, so the CEO of Dr. Pepper has her to thank for a good chunk of their income. I know the Dr. Thunder was probably purchased because it was about the cheapest pop you could find, but I like to think that she was just being a really awesome hipster about 15 years before being a hipster became a thing. She made my dad flannel shirts, I have now stolen some, and that’s a pretty hipster thing to do. If she wasn’t hipster, she sure was a little off-the-wall which now looking at it explains a lot about her daughter (my grandma) and me, too. My great grandma would go down to the basement every day with me and play with this plastic playground ball we bought at Cash*Wise in New Ulm. She would sit on the couch with a five-gallon pail in front of her and I’d throw this ball into the pail. We’d have a “Best of Country Music” CD playing songs like ‘Crazy’ by Patsy Cline and ‘Stand By Your Man’ by Tammy Wynette and we’d do that for at least an hour a day. This pail toss did nothing for my athletic skills, but it sure provided a lot of conversation, memories and my love for classic country music. We didn’t leave the house much when I went over to hers. I can remember going to New Ulm once and Hutchinson once, vividly. 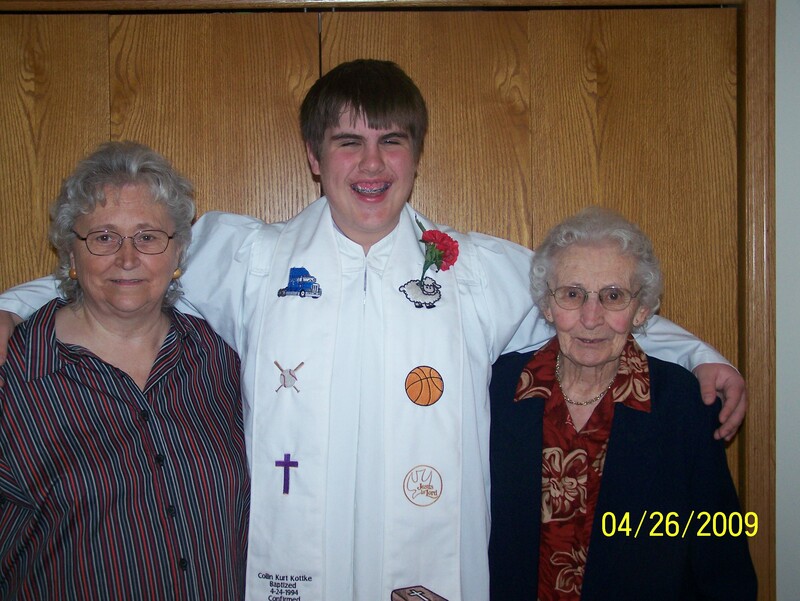 It was weird going to Hutch, because Great Grandma was quite the New Ulm person. New Ulm’s KNUJ was always on in the kitchen, she did most of her shopping in New Ulm and she got the New Ulm newspaper, so I don’t know why we went to Hutch that one time, but it was probably destiny. We went to Wal-Mart on that one trip to Hutch and right when we walked in the door there was a guy selling a board game. Yes, a board game that wasn’t even on the shelves at the Hutch Wal-Mart or probably any Wal-Mart in the world. The game was ‘Going, Going Crazy’ and for some reason, she bought it. To prove how obscure this game is, it has one review on Amazon right now. I’ll have to find the game, but I believe the guy selling the game in Wal-Mart was the creator and he signed the inside of the box for us. Simply, Great Grandma and I were the flame to moth of celebrities. The game was a ton of fun and we played it a lot. Go Fish was another one of our favorites. We did a whole lot of fishing without ever leaving the kitchen table and life kind of revolved around that kitchen table at her house. When my mom would come pick me up at the end of the day, it always meant dessert and some more Dr. Thunder. More than likely it was some cookies and every time there were some cookies in the cookie jar behind the KNUJ-playing radio. She lived in this farmhouse in the middle of the country and it had a long straight driveway from the gravel road to get up to the yard. Every single time that you left in the car, you looked to your left at the windows that were right above the sink and she would be right there waving you goodbye. Every single time. For as long as I live, I will see that wave. She’ll never cease to amaze me. She had gardens, mowed her lawn and was simply doing things that people in their eighties shouldn’t be doing, but she did them and with a smile. I never saw her complain and I think in my 21 years on this marble we call Earth, I’ve probably complained more than she did in her 90-plus. That’s just the kind of person she was. There wasn’t a puzzle she couldn’t solve, a Showcase Showdown she couldn’t place a winning bid on or a ball from a five-gallon pail she couldn’t throw back. If life is a puzzle it’s a 10,000 piece behemoth that’s not even a picture, it’s just a solid color, but she made life look like it was a 15-piece Thomas the Tank Engine puzzle. There’ll never be a better puzzle solver in this world. While the hearts of the ones who loved her might be in pieces, just remember that she gave us the love to put it together again and to make a beautiful picture. The angels I have in heaven are beyond amazing. I miss them more than I can express. My Grandma Connie (left), Me (center), my Great Grandma Doris (right). We are all so photogenic. Like in 2009, I still can’t take a decent picture. Yay, you hoar! Diving on in to the hoar frost!